Join us on Saturday, March 26 from 7-9PM to give Greg and Lucretia Speas a listen! Call 828.765.4583 if you would like to reserve a table. 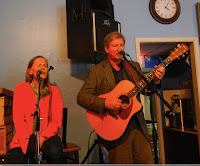 Greg and Lucretia have been performing together since their move to Mars Hill, NC in 2010. Singing mountain ballads and original tunes, their harmonies are powerful as well as unique, adding a new dimension to classic themes. Greg’s strong rhythm guitar and strong vocal is complimented by Lucretia’s soulful, haunting harmonies. Greg has performed in several groups over the years, and Lucretia sang at the National Folk Festival in Greensboro, NC this past fall. We will be closed Sunday, March 27. Happy Easter!